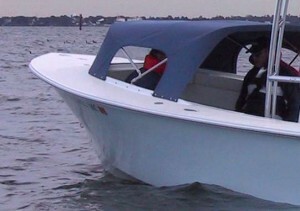 The first and most important parameter for the new 23 was to create a boat which could go where a flats skiff could, but have room to accommodate as many as 5 or 6 people. While it almost seems impossible for a boat with a tower, high sides and a deep V bow to float in 9.5 inches, that’s just what this boat will do. 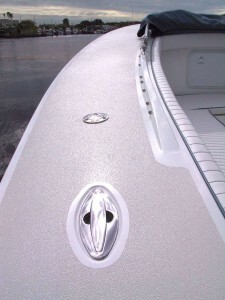 The key is a strong, lightweight hull which is the result of modern composite construction. The beam is generous for a boat of this size creating a stable platform for the tower and a boat that will run across the flats like a much smaller skiff. Designed from the beginning with this very goal in mind, the Gause Built 23 represents the perfect execution of the Gause family vision. Flared bow for a drier ride. One of the significant improvements incorporated in the Gause Built 23 was a bow with more flare. Not only did this give the boat a more attractive look, it created a much drier boat. When you spend as much time fishing and boating as the Gause family does, a dry comfortable ride isn’t just a pleasant feature, it’s a requirement. Most boats built to run as shallow as this one sacrifice ride quality and can tend to be rather wet, but the carefully crafted bow of the Gause Built 23 offers a ride much more like you would expect from a larger center console fishing boat. Wider gunwales for sure footing. 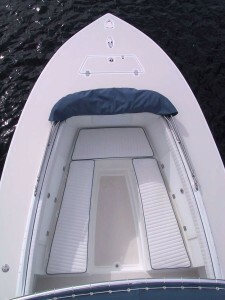 Another feature introduced on the Gause Built 23 is the wider gunwales. You can easily walk around the entire boat on the gunwales which are non-skidded and have flush Pop Up Cleats, rod holders and a flip up bow light. Wide and stable enough to stand on while using a cast net to catch bait, the wide gunwales make everything easier from getting into the boat in the morning, to tying up at the end of the day. Whether you are moving around another angler or simply looking for a comfortable place to sit, the wide gunwales are a popular feature which everyone likes. The Gause Built 23 has a top loading anchor well which makes anchoring a breeze. Designed to hold an appropriately sized anchor and plenty of rode, this top loading well makes anchoring the boat easier, quicker and cleaner. The door has a notch for the anchor rode to exit so that it remains flush when the anchor is down, never upsetting your footing should you need to walk across the bow of the boat. Inside the anchor locker is a beautifully crafted holder for the anchor which keeps it securely in place while traveling, and quickly at hand when you’re ready to stop. Roomy and comfortable forward seating. The forward seating area was improved in the 23 as well. With significantly larger seats, and a more ergonomically desirable seating position, the 23 offers better passenger amenities than most bay boats. The whole forward area was designed so that it could easily and efficiently be covered with a dodger, and the seats are long enough to act as berths, so that the boat could even be used for an overnight trip. One owner has ordered a custom dodger which incorporates rear doors with mosquito netting windows so that the entire forward area becomes a well ventilated but covered berth for two people to camp in.